Automation Studio is a completely integrated software solution for the construction, simulation and animation of circuits from the fields of pneumatics, hydraulics, PLC, Grafcet and electrical controls. 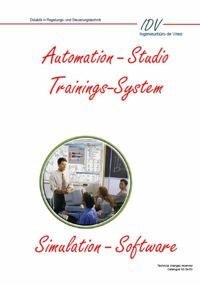 Automation Studio is the ideal CAD and simulation tool for lecturers, students and engineers. You can compile projects with more than just one diagram with Automation Studio. This is especially helpful when separating diagrams according to type and function. All diagrams interact during the simulation! Automation Studio requires no additional editing software. Easy to use toolbars and menus for editing tasks are already integrated. With the additional drawing tools and grouping functions you can create special symbols with any level of difficulty. The individual components are animated during the simulation and lines are provided with a colour code corresponding to their status. You can regulate the speed of the simulation, for example original speed, slow motion, single frame and freeze. Create your own symbols, components, libraries and templates. With the aid of standard components, flexible drawing tools and grouping functions you can now create user-defined symbols and libraries for specific requirements. With this, constructing engineers can create modules from individual components and file the corresponding data and symbols in a separate library. You can create specific libraries for special exercises for lessons that are restricted to the components required by the students. Beyond this all components of a project can be saved in a library by one single command.